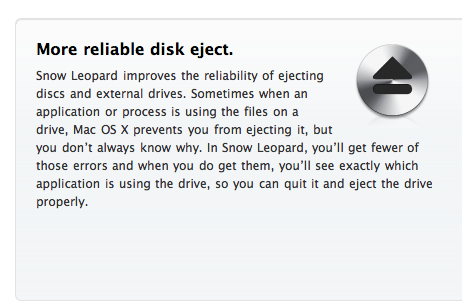 Well, looks like reddit is making fun of more reliable disk eject in Snow Leopard (pic, and context (bottom of the page)). While I don't think that disk eject improvements necessarily needs it's own icon, it is a feature that's nice to have, and makes the OS experience better. Ever had one of those times when you try to eject a CD or removable drive and it just says "can't eject" and you can't figure out why, and end up having to reboot? It happens on Mac, Windows, and Linux... this is just a little feature that will tell you what process is preventing the ejection. Simple, but a nice bit of polish (IMHO) that adds a bit more user friendliness to the OS. Pretty sure that Ubuntu has this as well come to think of it. As another side note, looks like Windows 7 does this too, which is more good news.